Albuquerque New Mexico Granite Countertops Starting @ $34.99/SF. T&T Stone, is a family-owned and locally operated company that has been in the renovating business for almost a decade. Professionals in Marble, Silestone, Della terra quartz, Granite, Travertine and soap stone. Our company thrives in referrals from existing satisfied customers and new construction. Customer service and professional craftsmanship has always been our number one goal with each project. We guarantee quality and service whether if its a small bathroom countertop or a complete kitchen renovation. - Same day Removal of your old counter tops and install the new! - Bonded & licensed & insured. - Direct fabricator & installer. We use only the best materials and very detail to assure quality professional services! Granite Countertops Starting @ $34.99/SF. Limited Time only. Minimum 40 sf required. restrictions may apply subject to change without notice. "Awesome craftsmanship and outstanding effort that exceeded our expectations! T&T did an excellent job at a fair price - they are my go-to-team for future granite and cabinetry projects!" 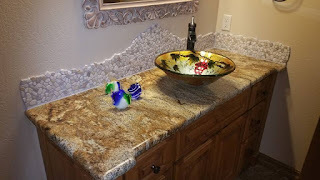 "My husband and I are very pleased with the granite vanity tops that we purchased from T&T Stone. They were extremely professional during the measuring and installation. The vanity tops are absolutely beautiful. If you are looking for a very reasonably priced contractor and product, we would highly recommend T&T Stone." "they did my kitchen.. they left me speechless every detail was done with care.. they truly listen to their customers needs.. you pick it they will do it no matter the length or work needed.. thanks T&T Stone"
The guide to kitchen remodel with Granite or quartz Countertops.